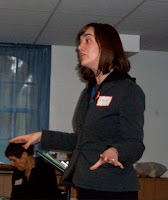 On April 11, AfD members from Eastern Massachusetts and Rhode Island met for a day-long conference entitled "Maintaining Democracy: Undermining the Corporate Agenda from the Bottom Up." It was an opportunity to find out more about member and supporters activism, and to hear from groups allied with AfD about their work, with special focus on climate change and localization, healthcare, and media. introduced Concord (MA) actions on climate change and the transition town concept, and David Lewit talked about economics and localization, Cynthia Whitty gave a short history of her town’s long-term community-building activism, and Ruth Weizenbaum recognized the volunteers who keep the “Other Voices” video project on the air. 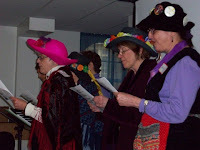 Raging Grannies provided the music! It was a full day, with, sadly, less time for open discussion than had been originally planned. A “post conference” chapter meeting is in the works to consider follow-ups to the event, including a possible New England conference in the fall, and a roundtable on localization and building local and regional economies.